Summary: In "At Summer's End", a chance reunion with a childhood friend leads to love, but is it requited…? "Wind Singer" is the bittersweet tale of friendship between a spider and a moth larva. In "The Curious Tale of 13 Moons Villa", art student Tatsuro opens his closet one day to find a strange young man who claims to remember nothing except the fact that he lives in Tatsuro's apartment. 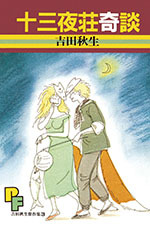 In "The Fox's Bride", Ojiro wonders why he's different from other foxes and goes on a quest to find his heritage. "Zashiki Warashi" tells the tale of a type of friendly ghost. "Acapulco Gold" imagines a future where marijuana is legal and common, and tobacco has become a rare illegal drug.